Armstrong's Hyundai 33L-7A LPG counterbalance 3,300kg load capacity forklift. Five Hyundai forklifts have been tasked with the handling of the high-end tiling material at the Stafford, UK, production facility of Armstrong World Industries, which designs and manufactures floor and ceiling coverings. The American-owned business, which has supplied tiling solutions to the Melbourne Royal Children’s Hospital, NAB Bank, Myer Emporium, London Underground, Canary Wharf and Jeddah Airport, also has facilities in France, Australia, Germany, China and the US. 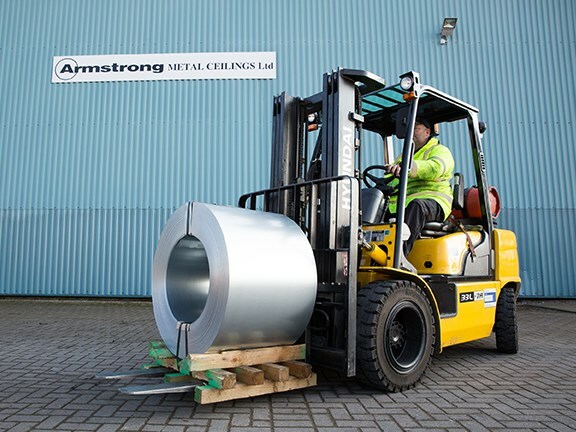 Up until 18 months ago Armstrong’s Stafford facility was using a one-man operation for all of its lifting and moving requirements, but as the company expanded its UK operation, a more consistent and steady solution was needed to fulfil the demands of a growing business, and more forklifts were required. Armstrong now has a range of Hyundai machines working in Stafford, including the 33L-7A LPG counterbalance 3,300kg-load-capacity forklift, the 20ET-7N (2,000kg) electric pallet truck, a 20DA-7E (2,000kg) forklift and a 33D-7E (3,300kg) forklift. The machines are working 24 hours a day in shifts. "We have a small facility here at Stafford of around 2,500 metres with two large sheds," Armstrong World Industries production manager Matthew Robinson says. "We are situated in a cul-de-sac so access is quite restricted and pedestrians are always present so safety was one of the major factors in selecting machines to work on the site. "We had blue warning lights installed and the speed is restricted too. There is also a safety check function on the machines screen which checks all safety aspects of the trucks. "Visibility is also good and the operators report that they are very smooth to run," he adds. Other features on the forklifts include GPS system and impact sensors. Robinson says the machines work inside as well as outside so the company opted for LPG as opposed to diesel. "The machines can lift 2.5 tonnes with ease and have no problem reaching 3 metres in height," he says. 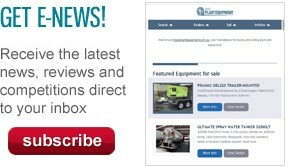 "Our 3.5-tonne ‘Milkman’ truck is moving materials all day which include coils and steels — the others are moving and distributing incoming goods and raw materials."